1° 00' N, 32° 00' E.
Uganda has substantial natural resources, including fertile soils, regular rainfall, and sizable mineral deposits of copper and cobalt. Agriculture is the most important sector of the economy, employing over 80% of the work force. Coffee is the major export crop and accounts for the bulk of export revenues. Since 1986, the government - with the support of foreign countries and international agencies - has acted to rehabilitate and stabilize the economy by undertaking currency reform, raising producer prices on export crops, increasing prices of petroleum products, and improving civil service wages. The policy changes are especially aimed at dampening inflation and boosting production and export earnings. In 1990-2000, the economy turned in a solid performance based on continued investment in the rehabilitation of infrastructure, improved incentives for production and exports, reduced inflation, gradually improved domestic security, and the return of exiled Indian-Ugandan entrepreneurs. Ongoing Ugandan involvement in the war in the Democratic Republic of the Congo, corruption within the government, and slippage in the government's determination to press reforms raise doubts about the continuation of strong growth. In 2000, Uganda qualified for enhanced HIPC debt relief worth $1.3 billion and Paris Club debt relief worth $145 million. These amounts combined with the original Highly Indebted Poor Countries HIPC debt relief add up to about $2 billion. Growth for 2001 should be somewhat lower than in 2000, because of a decline in the price of coffee, Uganda's principal export. as already explained under activities in "about us" we are heavily engaged in Uganda. with farmers on the Mount Elgon.. Member of the A.C.P. 1EEC. Lome Agreement. Cultivated Area : 400,000 hectares. 95 to 98 % of exports. around Mount Elgon (Northeast) along the Kenyan border: the best coffees. in the Eastern mountainous regions. in a 300 km radius around Lake Victoria. Practically year round depending on the altitude. two harvests per year, one major and one lesser. practically year round, peak from November to February. (practically unused since grading has been started up again). the worst of the waste: husks, dust, skinsrisks setting the roasting equipment on fire. If dust is removed, there is about a 20 % loss, with removes all interest in using this. Dry : free from all traces of mustiness. Uganda : free of undesirable odors or taints. Wet process: Washed : free of fermentation. Quantity purchased from the growers, but total production is estimated at 4 to 4.5 million bags. The difference between the figures are the quantities smuggled out to Zaire. 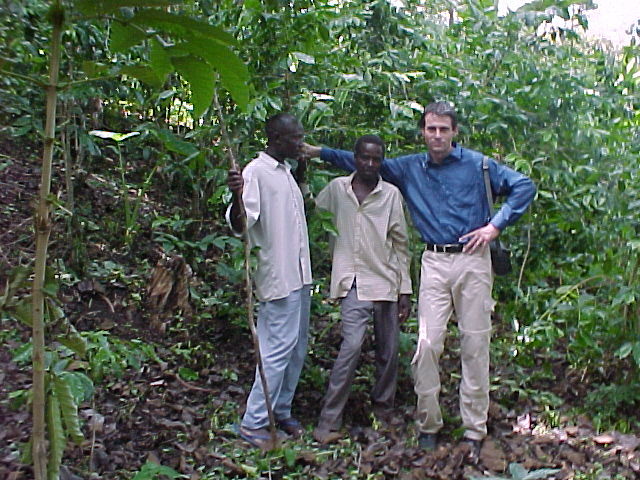 Encouraged by the C.M.B., however, it remains low since Ugandans are traditional tea drinkers. A state organization, the Coffee Marketing Board, had the monopoly up until November 1990. - New York for the United States and Canada. - Busoga Coop. Union Ltd.
which arranges tenders every 15 days. U.N.EX. is a joint state and private firm created under the aegis of the World Bank. The total capacity of its processing plants is 60,000 tons. via Lake Victoria: to avoid exclusive dependence upon Kenya abt. 20 %. 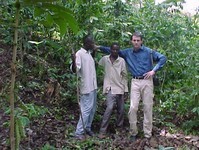 The C. M. B. buys : the Arabica parchment from the farmers, processes it and sells it, the Robusta cherries (Kiboko). The C.M.B. 's responsibilities are : to promote research, to improve quality, to maintain relations with the other African coffeeproducing countries. Robusta : station in Mukuno. Arabica : stations in Mbale and Kawanda. Uganda has no direct access to the sea. Its exports rely on good relations with its neighbors and they often face a type of bottleneck depending on the condition of the relations. Arabica is attacked by : C.B.D. (Coffee Berry Disease), coffee rust. Robusta is attacked by coffee cherry borer. uncontrolled prices in neighboring Kenya.